Resco’s privacy screens are perfect for high use and wet areas. We can do modesty screens up to full screens to make a privacy wall. The Compact Laminate panels provide extended product life, and the screen colour can be matched or contrasted to the cubicle systems or Multicom wall panelling. • Impervious to waters so suitable for high use and wet areas. • Smooth screen surface for easy cleaning. • CNC machined half round edging. 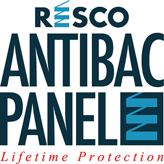 Resco's privacy screens are perfect for high use and wet areas. We can do modesty screens up to full screens. 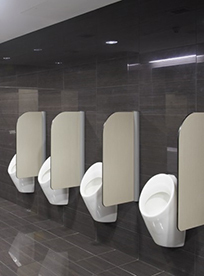 The Compact Laminate panels provide extended product life, and the screen colour can be matched or contrasted to the cubicle systems and Multicom wall paneling.